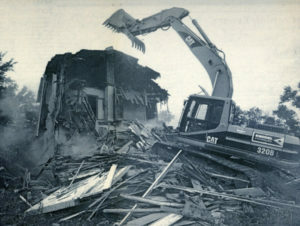 Kelly Knodel of Knodel Contractors uses his excavator to take down the Klasi House on the site of the Prairie Arboretum being built near the campus of Freeman Academy. The house has been a landmark near the corner of the North County Road and the South County Road for nearly a century. The farm and 43 acres of surrounding land was purchased by Freeman Academy in 1974, which made way for expansion at the school…from the Heritage Hall Museum complex to the Prairie Arboretum. The house was taken down Wednesday, Aug.16 as part of the arboretum project, which is continuing this fall with major steps planned. If all goes according to plan, said Lyle Preheim, who is playing a major role in the project, digging of the large pond should begin sometime next month. The pond will join two smaller ponds dug last year. Also this fall, an additional 100 trees are scheduled to be planted, joining more than 60 others put in last summer, ranging from Douglas Firs to Colorado Spruces to Australian pines. When its said and done, more than 450 trees will compliment the native grasses on the land.